With the first Cortex A53 based SoCs due to ship in the coming months, and Cortex A57 based designs to follow early next year, ARM gave us a quick update on performance expectations for both cores. Given the timing of both designs we'll see a combination of solutions built on presently available manufacturing processes (e.g. 28nm) as well as next gen offerings (20/16FF). The graph above gives us an updated look at performance expectations (in web browsing workloads) for both ARM 64-bit cores. If we compare across the same process nodes (28nm in both cases), the Cortex A53 should give us nearly a 50% increase in performance compared to ARM's Cortex A7. 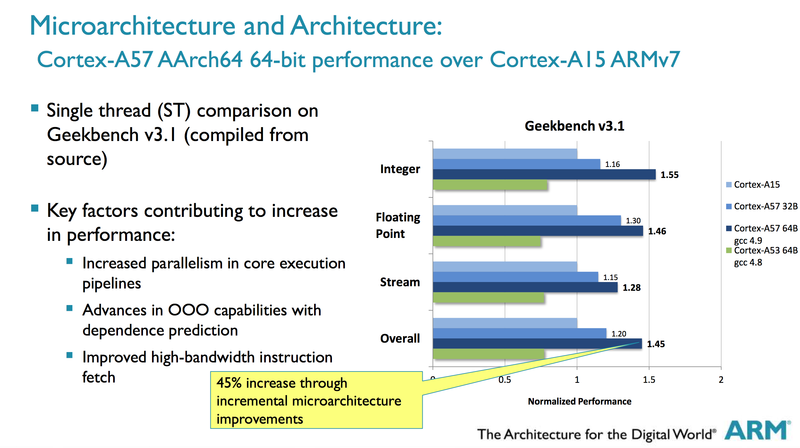 The Cortex A57 should offer roughly the same increase in performance compared to Cortex A15 as well. Although the A57 will do so at higher power, power efficiency may be better depending on the workload thanks to the added performance. Thankfully we won't see many A57 designs built on 28nm in mobile (AMD's first Cortex A57 design will be aimed at servers and is built on a 28nm process). If you combine architectural improvements with a new process node, the gains are substantial. Move to 20nm or 16FF for these designs and the improvement over their 32-bit predecessors easily exceeds 50%. 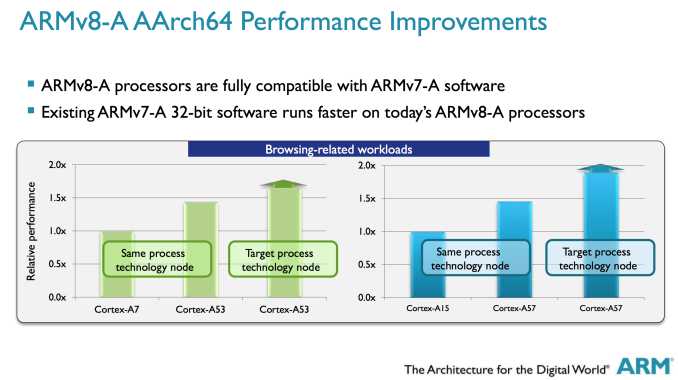 ARM also provided some Geekbench 3 performance data comparing the Cortex A57 to A15, both in 32-bit and 64-bit mode. We already know Geekbench 3 is particularly sensitive to the new instructions that come along with AArch64, but even in 32-bit mode there's still a 15 - 30% increase in performance over the Cortex A15 at the same clocks. Qualcomm has already announced its Snapdragon 410, 610 and 615 will use ARM's Cortex A53, while its 808 and 810 will use a combination of Cortex A53s and A57s. "(Qualcomm missed the armv8 boat badly)"
or none at all, because they're an ARM licensee. If Krait isn't competitive vs. vanilla ARM for the next year, QC can roll vanilla ARM products until Krait's successor comes on stream.